When my husband and I married in 2005, we registered for a Cuisinart Duet Blender/Food Processor and were very happy to recieve one as a gift. Although it proved difficult to clean and at times nearly impossible to re-assemble, it worked. 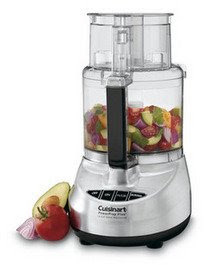 In December 2008, my husband decided that I "needed" a real food processor and bought me a lovely, full-size stainless steel machine. Initially, I was quite frustrated that he spent that much money and that he bought me a kichen applicance for Christmas. I got over that the first time I used it. Look out world! I can now make anything from cookie dough to bean dip in my food processor! I can slice raw chicken (partially frozen), chop veggies into pieces so small that they can't be detected by veggie-haters, and make huge batches of homemade salsa for warm nights on the deck. It's kind of a pain to clean, but it's dishwasher safe, so I can't complain. When my mighty Kitchen Aid Artisan went down last weekend, the Cuisinart picked up the slack and whipped up my cookie dough. Put this one on your list.